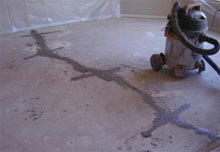 Are foundation problems causing cracks in your floor? 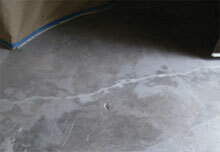 Whether they are caused by foundation heave or settlement, by utilizing the incredible strengthening properties of Glass, Kevlar, and Carbon Composites, we can provide a cost effective foundation repair solution for your concrete cracks. Carbon fiber has been used in everything from the Space Shuttle to the Boeing 777 Dreamliners. These materials have made their way in to mainstream construction and are creating numerous benefits including foundation crack repair and much more! 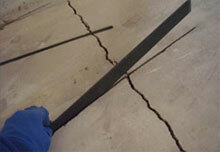 By utilizing pre-cured carbon fiber stitching systems used to bridge shear forces, we can repair cracks in foundations and floor slabs. The systems are installed at a fraction of the cost of traditional steel dowels and with less heavy equipment and disruption to the homeowner. Arizona Foundation Solutions has become certified applicators for HJ3 Composites and is the preferred applicator for the Greater Phoenix & Statewide Region of Arizona. 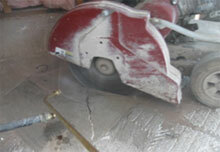 HJ3 is one of the world leading authorities on the use of these materials in the construction environment. 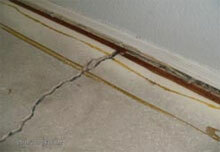 Get A FREE Foundation Crack Repair Quote Today! The following is an illustration of the stitching process. 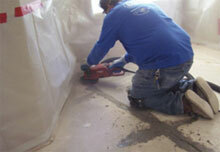 Step 3 - Fill cracks and around carbon fiber slits with super low viscosity polyurea.